Nuts To You Raw Almond Butter is made from California almonds and can be used the same way as other nut and seed butters. It makes a great spread on bread and crackers and gives a different flavour profile in sauces, dressing and smoothies. 4/5 only because of the steep price. Otherwise a very good almond butter. This is the best almond butter. I have tried many. I even prefer this to the almond butter I get to make myself in bulk barn stores. There is an almost sweet taste to it. I use this mixed with yogourt. I used to use flavoured yogourt. Now I buy plain and just add a little honey. My favourite was the vanilla yogourt mixed with coffee or mocha flavoured yogourt mixed together with the honey. This was so good, especially considering it was the higher fat content of yogourt. You might want to try this yourself and use, well, whatever yogourt you like. YUM!! Our favourite almond butter! Delicious ! Repeat purchase. Nice to buy raw when it's on sale. This is our favourite almond butter! Excellent quality, Nuts To You is our go-to brand for nut butters. 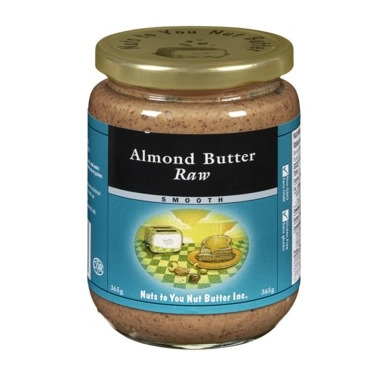 Raw almond butter is a gold-standard for nut butters in my pantry, it's exceptional taste is just that hard to beat. First choice for nut-butter'n'jelly sandwich treats and baking expeditions - great for vegan burger recipes. Nuts to You is my go to brand and I've not regretted a purchase yet thus far. My husband loves this raw almond butter and there only 2 places where I can buy it and you are my first choice because your price is better and because I buy so many other products from you, re baking, where you are the only place that I can buy them ... your delivery is fast and the little notes in every order from the person who filled the order, have always said to me that you care about our family ... you are a remarkable company that hasn't lost the 'human' touch :)!